What do you get when you give the recipe for classic Dutch genevers gin to the folks at Oregon’s Ransom Wine & Spirits (i.e. Tad Seestedt)? You get Old World meets New—in a giant bear hug. Ransom’s Dry Gin is an electrifying combination of traditional malty hoppiness with intense Oregon-centric botanicals such as marionberry and local hops. It’s sustainably farmed and alambic pot distilled, using only the “heart of the hearts” (the best of the best) for bottling. The result is ethereal: hops and white flowers, fresh marionberry and juniper berries. It’s rich and silky in your mouth, with citrus and exotic spice notes. Started by Tad Seestedt in 1997 with a “small life savings and a fistful of credit cards,” Ransom Wine & Spirits was built on handcrafted products that pay homage to big dreams and and not-so-big wallets. 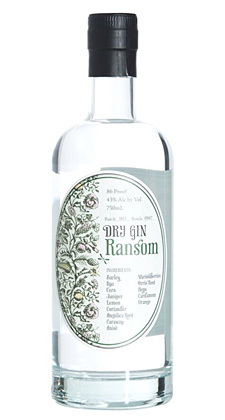 Read more about Ransom Dry Gin.